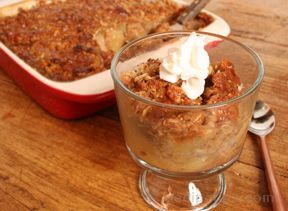 A delicious apple crisp variation prepared with the addition of orange juice and loads of melted caramel. 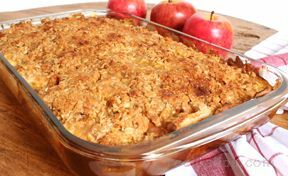 You will enjoy this Apple Caramel Crisp recipe with a combination of two great apple treats, caramel apples and apple crisp. Pick the perfect apple from our chart. Spray baking pan with non stick cooking spray. Mix together flour, brown sugar, oatmeal, and spices. Cut-in* butter until mixture becomes crumbly. *Cut-In: To combine dry ingredients with shortening, butter or margarine by "cutting" the dry ingredients in with a pastry blender or two knives. As the dry ingredients are cut into the fat ingredients they begin to form clumps. Press 1/2 of crumb mixture into bottom of prepared baking pan. Layer 1/2 of apples and 1/2 of quartered caramels over crumb mixture. Sprinkle with 1 cup of crumb mixture. 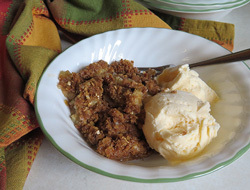 Repeat layer of 1/2 of apples and 1/2 of quartered caramels over crumb mixture. Press remaining crumb mixture over top. Drizzle with 1/2 cup of orange juice and bake uncovered for 35 minutes. Remove and drizzle with remaining 1/2 cup of orange juice. 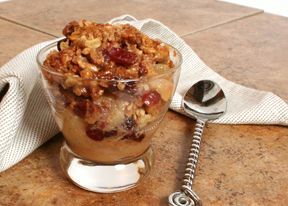 Continue baking 25 minutes or until apples are soft and mixture is bubbly. Tip: Using an automated apple peeler will cut the preparation time in half.